James A. Caywood was born in Kona, Letcher County, Kentucky and was raised in Kenton County. He graduated from the University of Kentucky in 1944 with the degree of Bachelor of Science in Civil Engineering. Following service as a Naval officer during the later stages of World War II, he began his professional career with the L&N Railroad. He later attained the position of chief engineer of construction and maintenance of the Baltimore and Ohio Railroad. During his tenure, he had the dual responsibility of serving as general manager of engineering planning for the affiliated C&O and B&O systems. After a brief stint with a railroad contractor, Mr. Caywood returned to his first love, the practice of engineering planning and design, when he joined DeLeuw, Cather and Company as a vice president. DeLeuw, Cather, a recognized leader in transportation planning and design, was awarded the coveted contract as the general engineering consultant for the development and design of the Washington Metropolitan Area rail rapid transit system. Mr. Caywood served as project manager for this award winning project which is generally recognized as the finest rail rapid transit system in the world. For his efforts, Mr. Caywood was inducted into the American Public Transit Association Hall of Fame. He also served as project director on the Federal Railroad Administration’s Northeast Corridor Improvement Project which consisted of upgrading the existing railroad corridor between Washington D.C., New York City and Boston for high speed operation. He became president and CEO of DeLeuw, Cather in 1978. Under his direction, the company managed the design and construction of highway, railway and rapid transit systems around the world. 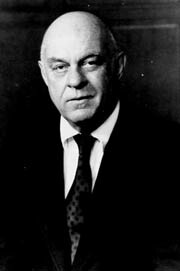 Mr. Caywood retired in 1988 and was given the title of chairman emeritus. During his years of active practice, Mr. Caywood was a licensed professional engineer in all 50 states, the District of Columbia and the territory of Puerto Rico. Among the many professional honors Mr. Caywood received throughout the years was election into the prestigious National Academy of Engineering as well as awards from the American Society of Civil Engineers, the American Road and Transportation Builders Association, and the Institute for the Advancement of Engineering. He was a Fellow of the University of Kentucky and a member of the College of Engineering Quadrangle Society. He was inducted into the UK Hall of Distinguished Alumni in 1985 and the College of Engineering Hall of Distinction in 1994. Mr. Caywood passed away on July 11, 2000. He is survived by his wife, Carol, his daughters, Beverly, Elizabeth and Malinda, and sons, Daniel and James IV.